Alright yall, today we are going to be openminded. I've always been somewhat of an adventurous eater and knew I was going to love this recipe the minute I saw it. The best way I can describe it is an Americanized version of Pad Thai. This peanut pasta was delicious, quick to prepare, and made great leftovers for me to eat on throughout the week. It's not too heavy but really felt like comfort food. If you're feeling adventurous, try it!! 1. Bring a large pot of water to boil for your pasta, but don't cook pasta just yet. 2. In a large skillet over medium high heat, drizzle your EVOO and sesame oil. Add in your chicken and cook through, about 4-6 minutes. Sprinkle a pinch of salt and pepper on top. 3. Add in the majority of your chopped green onions (save a few to garnish), garlic, and soy sauce. Saute for about 2 minutes. 4. Stir in your chicken stock and reduce heat to low. Stir in peanut butter with a pinch more salt and pepper, and simmer for about 5 to 8 minutes. Stir to coat pasta evenly. 5. 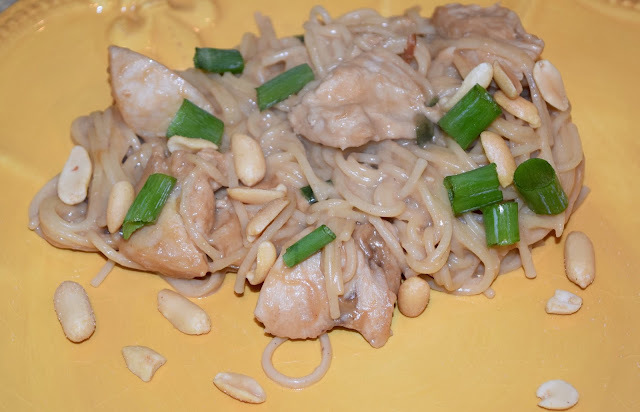 Garnish with a few peanuts and green onions and serve! This looks quite delicious and like something we'd love in our house! You are way more adventurous than me! I saw the post in my Bloglovin and opened it only because I wanted to see what it was that I wouldn't like to eat haha. Yum!!! Kyle loves stuff like this, I will have to try it. I love homemade pad thai!! Looks yummy!